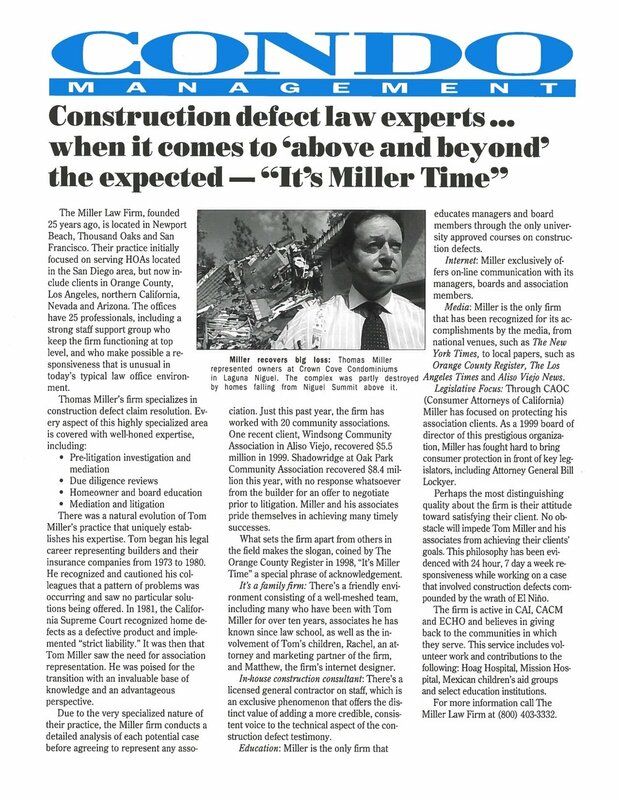 As an authority in the field of construction defect litigation for thirty-five years, The Miller Law Firm provides the finest quality of legal representation in the resolution of construction claims. 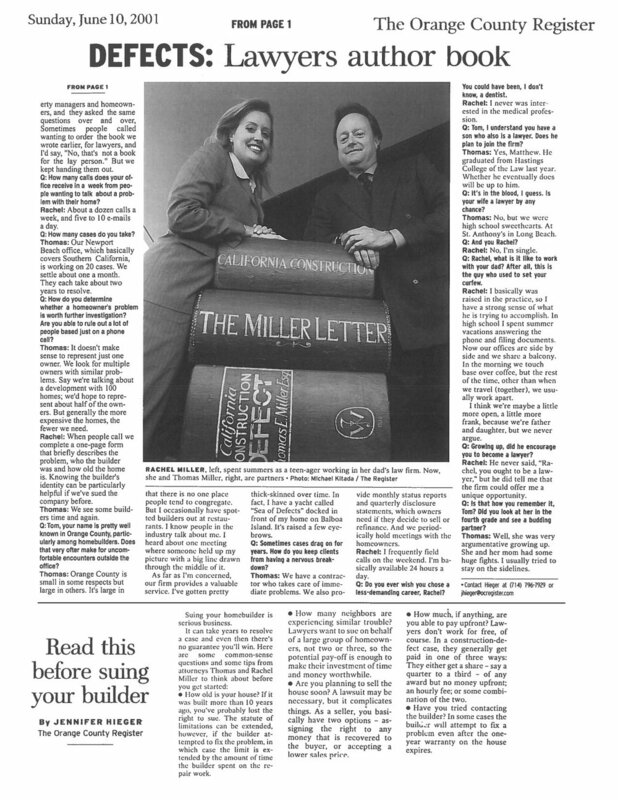 Having literally written the book, The Miller Law Firm is professionally adept at the proper approach to protecting the rights and interests of homeowners in urban mid-rise, high-rise, and mixed use associations. 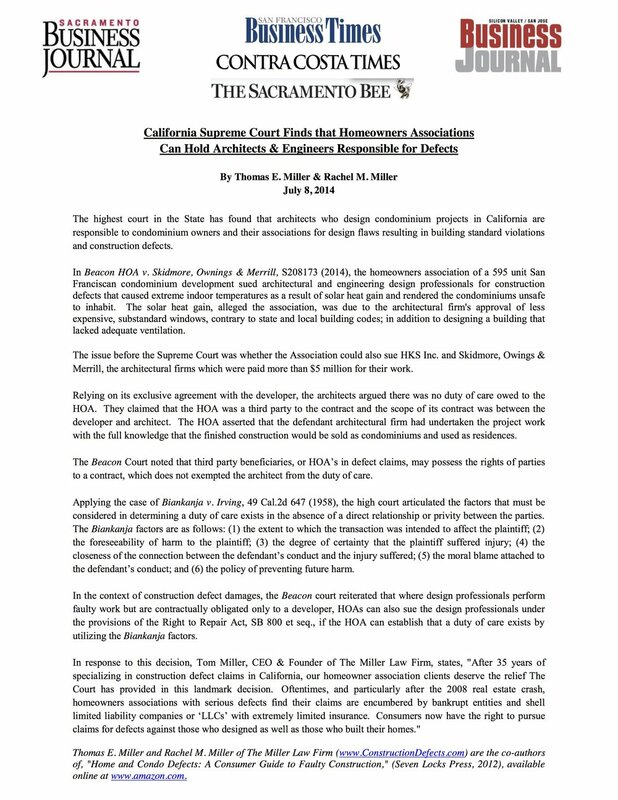 This signature practice, while focusing its attention in California, achieved national recognition in addressing the varied and complex issues of design and workmanship operative in faulty construction. 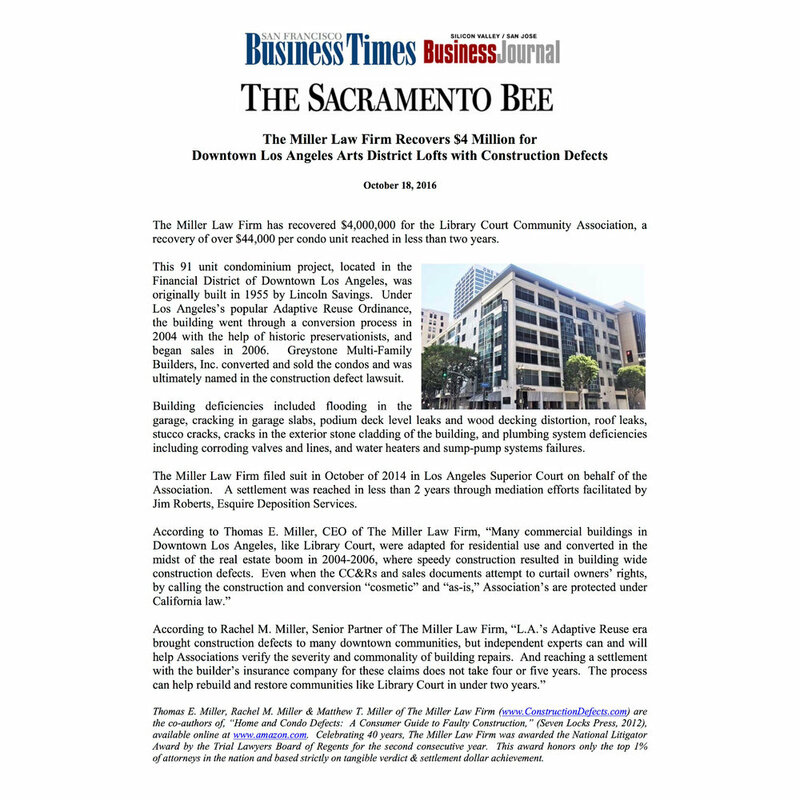 The firm brings to each building project decades of experience and a detailed knowledge of today's legal framework. 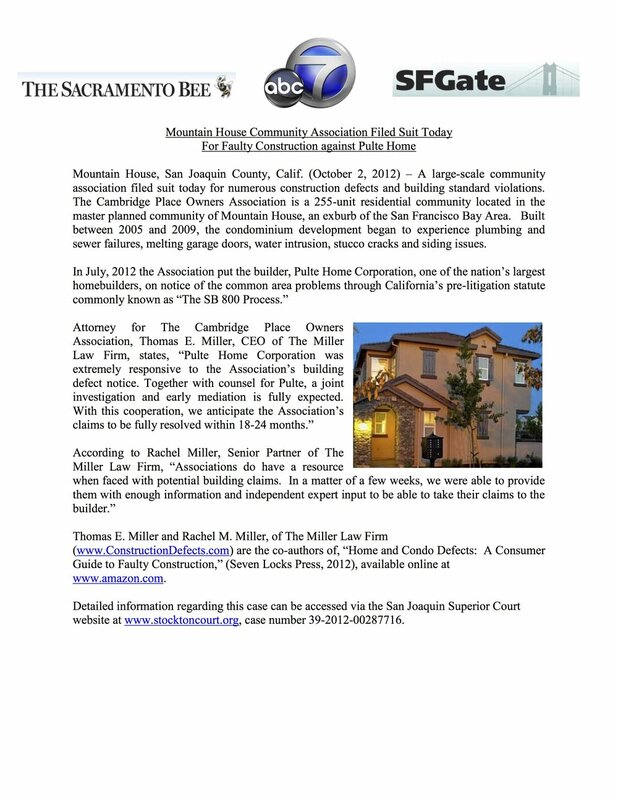 Its expertise provides a thorough accounting in understanding the complex network of relationships between homeowners associations and the myriad of participants ultimately involved in the efficient resolution of construction defect claims. 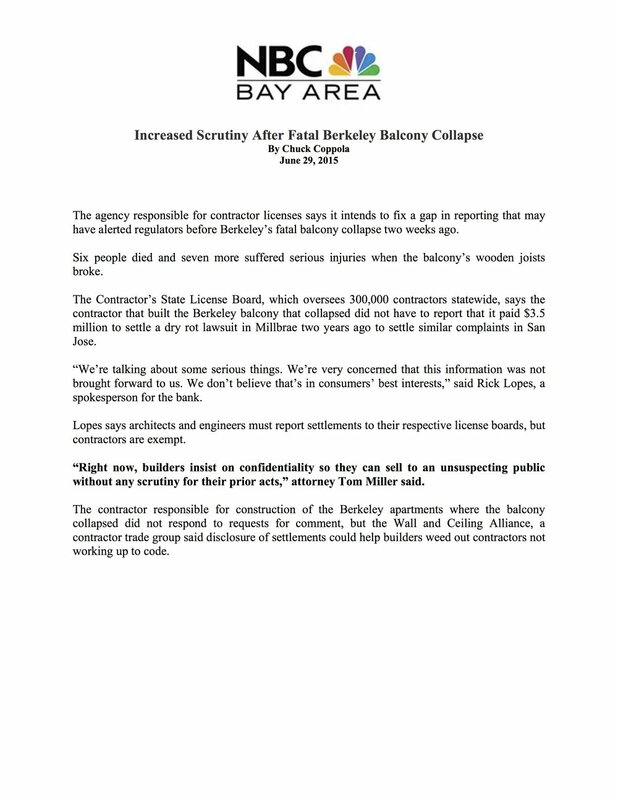 We do more than simply stay abreast of current legal developments. 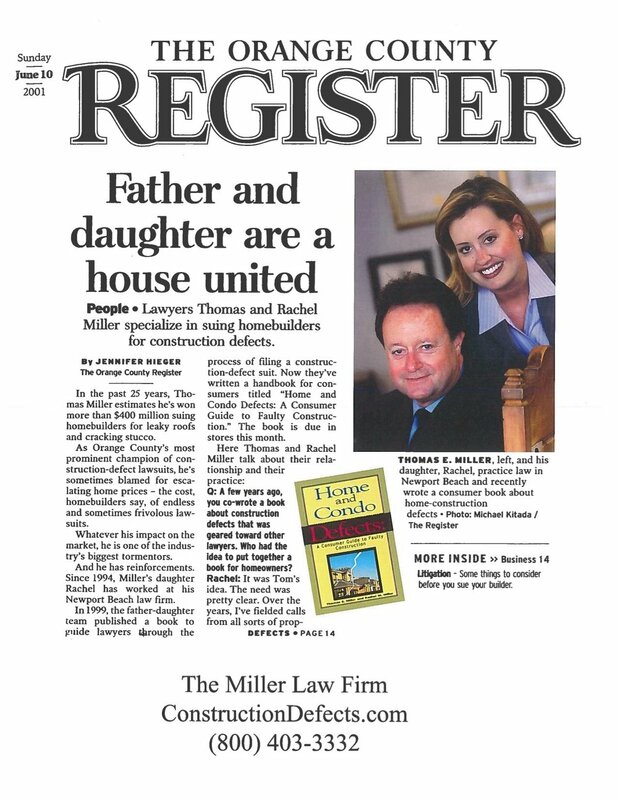 We actively contribute to the legislative dialogue shaping both our profession and the industry of real estate development. 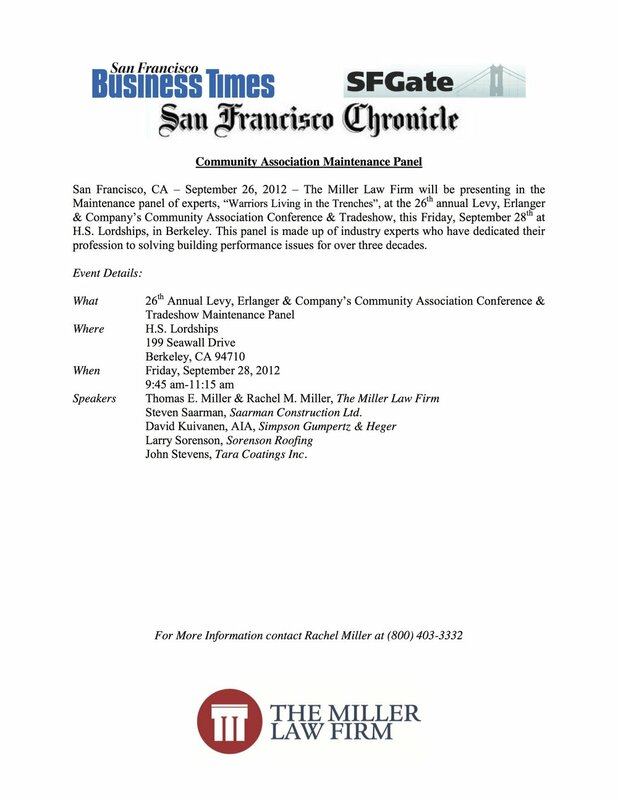 In addition, The Miller Law Firm has held influential positions on professional committees and boards, including the Community Associations Institute, California Association of Community Managers, and the Executive Council of Homeowners. We frequently present ideas at important local, state, and national industry conferences. 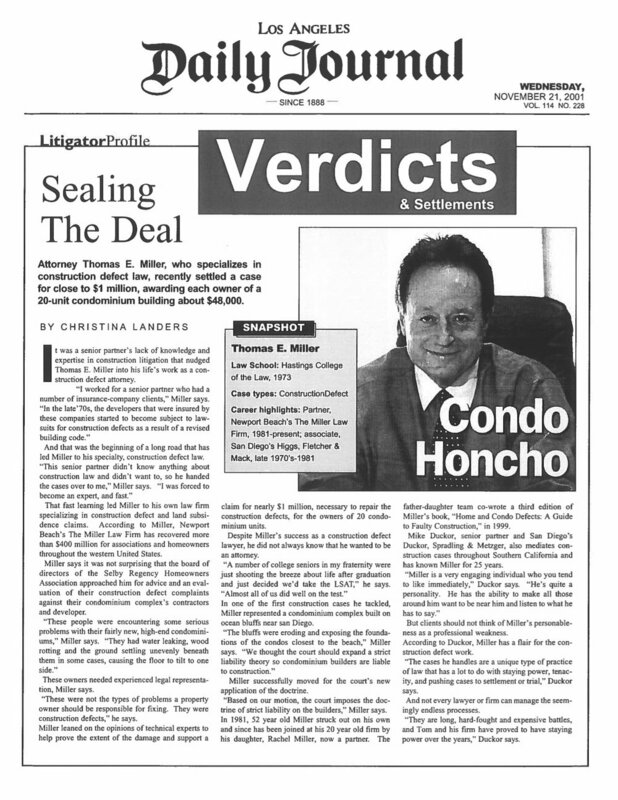 Meanwhile the commentary and analyses of our attorneys appear regularly in journals, newspapers and publications. 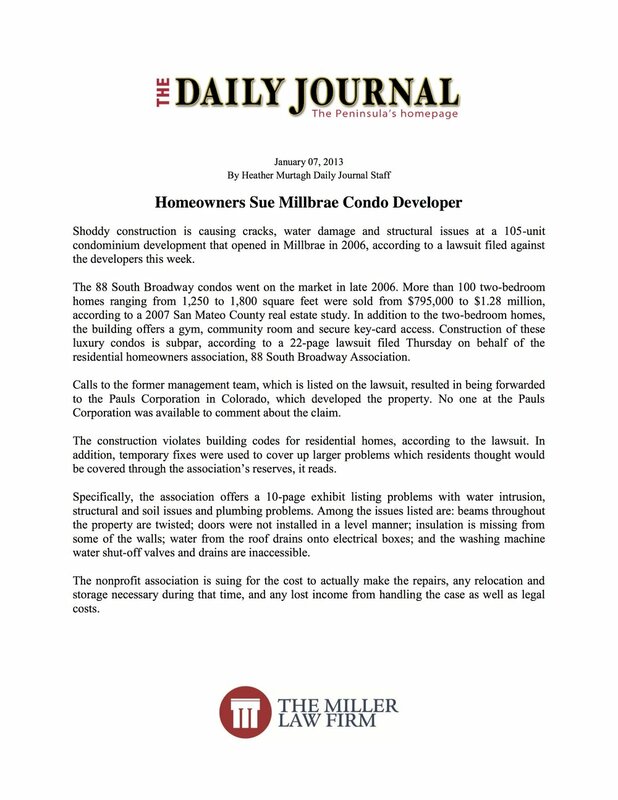 Today, we are also recognized as legal experts in the field of construction defects by top media forums. 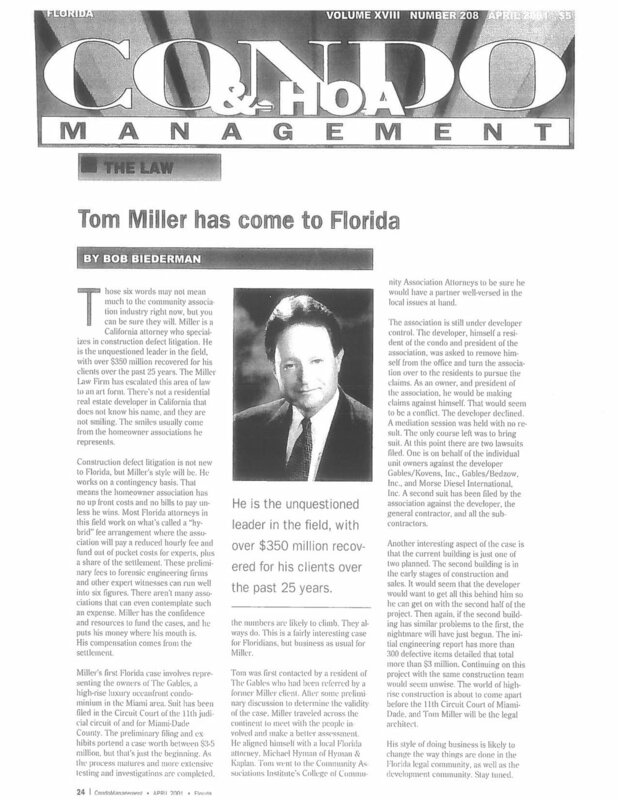 The Mission of The Miller Law Firm is to provide our clients with the highest standards of representation. 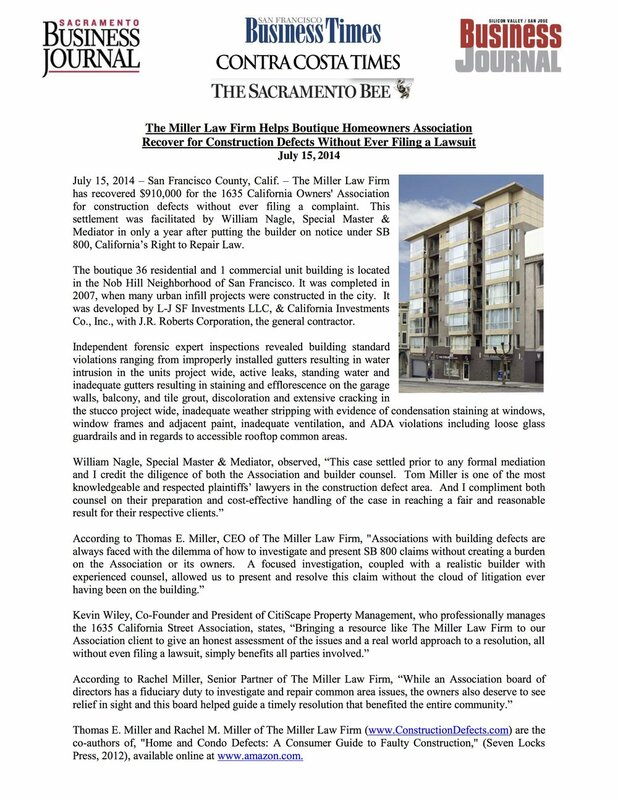 We will spare no effort to effectively and efficiently resolve our clients' cases with leading edge resources, expertise, and collective experience unmatched by any firm practicing construction defect law. 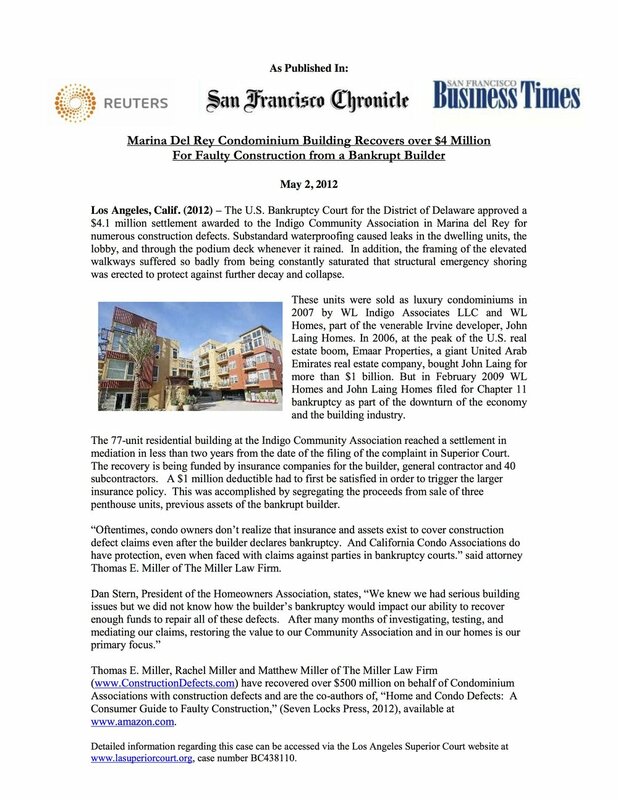 We accomplish our mission through the dedication and excellence of our team members who put our clients' interests first and employ the most innovative approaches to successfully resolve construction defect cases within 24 months of filing. 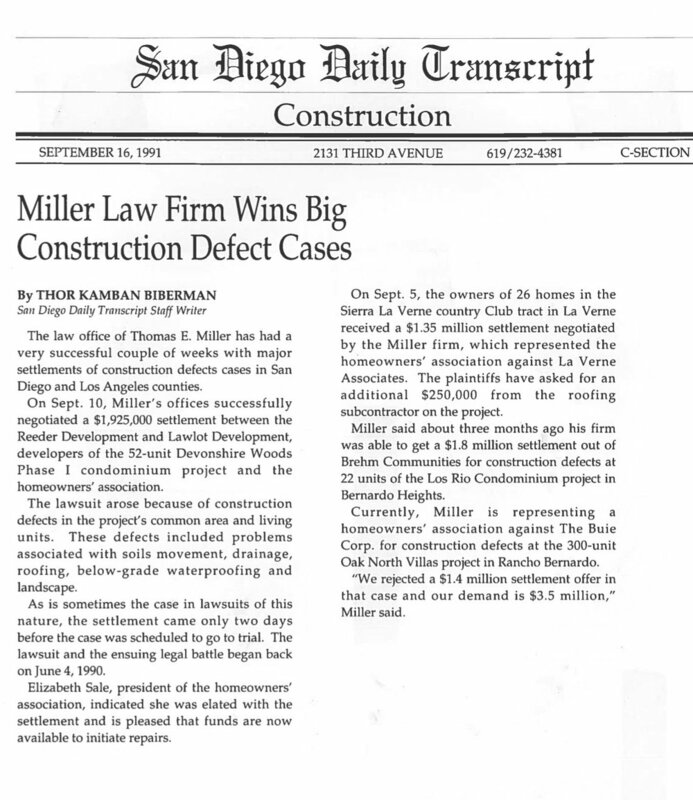 An important component to successful defect dispute resolution at The Miller Law Firm has been our commitment to serving our clients throughout the defect claims process. 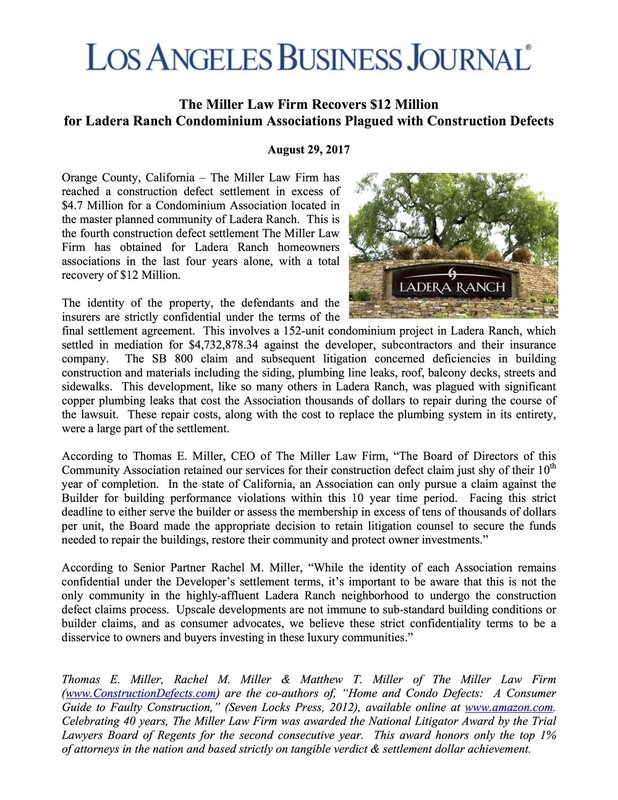 A construction defect claim takes a strong hand to guide this effort in an organized and efficient manner. We strive to create a process that removes unnecessary burdens on board members and association managers. 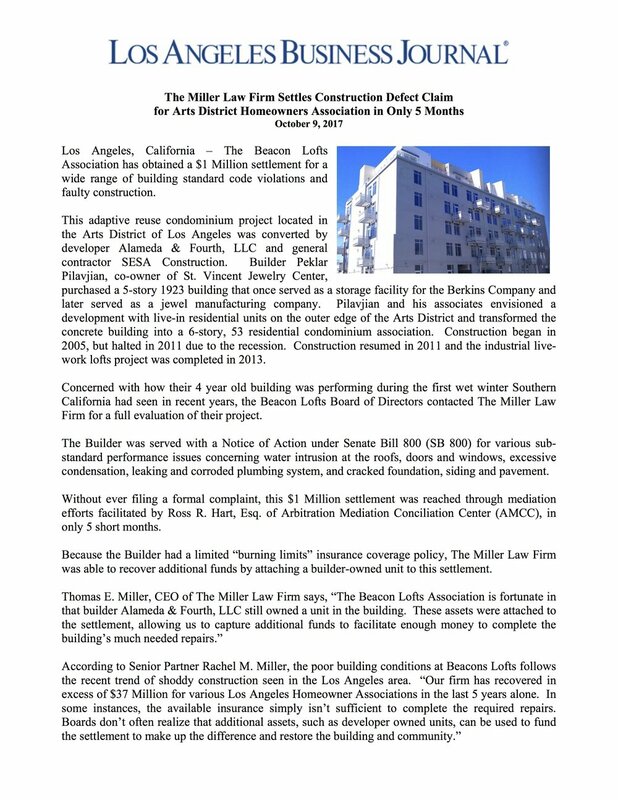 For new residential units built on or after January 1, 2003 residential construction standards are listed in California Civil Codes 896 and 897. 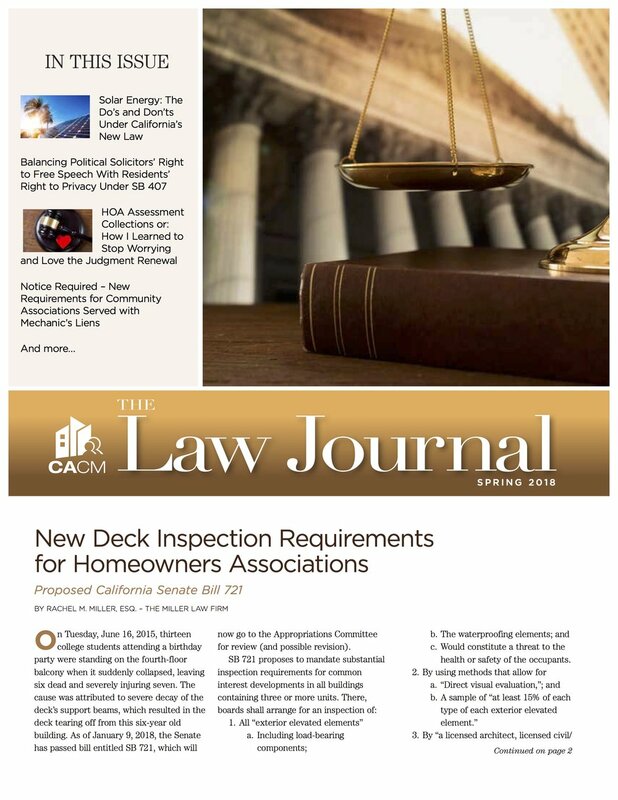 Section 896 lists defects, and section 897 provides a safety net for items that are not specifically listed in the statute. 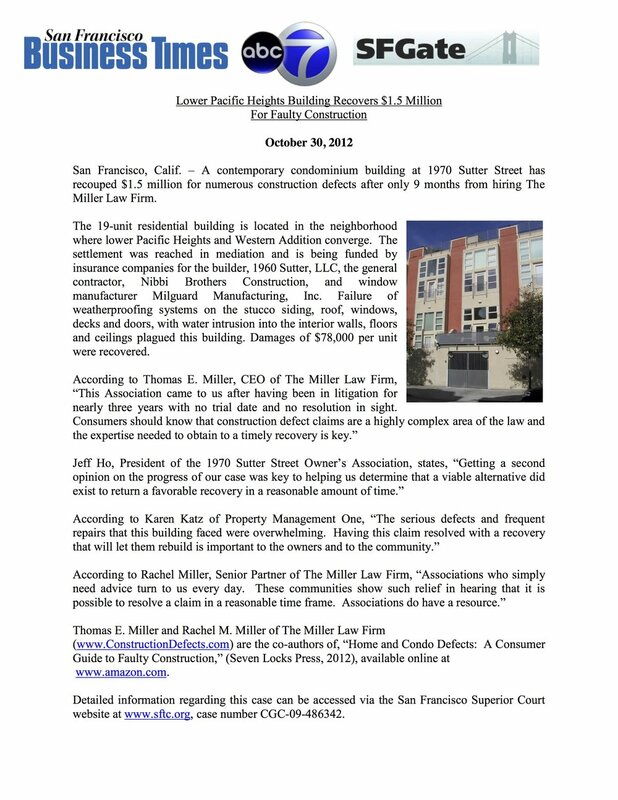 To read the statute in its entirety click here. 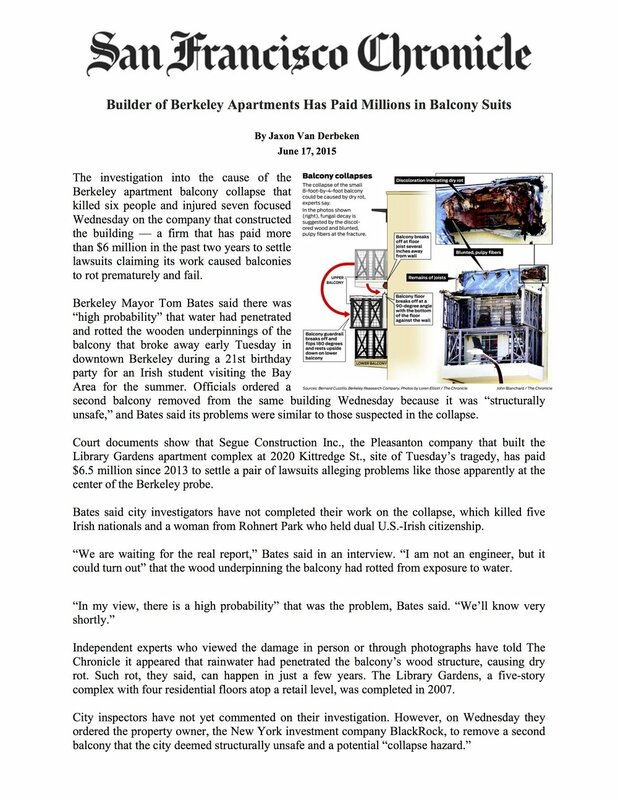 Prior to 2003, construction deficiencies were statutorily defined, however, if something causes damage to your home or condo, it may be considered a defect. 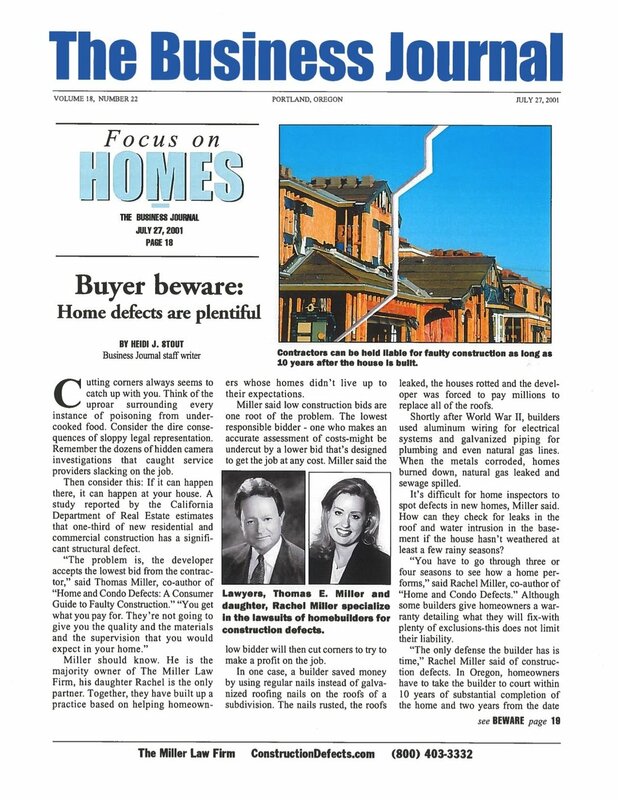 The information provided in this section is intended to allow the reader to become informed about some of the laws related to construction defect litigation.